Yes it is the time of the year when love is in the air. Valentines day is just around the corner and wherever I look there are banners for wedding shows. 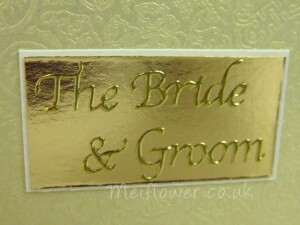 When we do the craft shows, customers who make there own wedding invitations are always looking for inspiration. So I thought I share this wedding invitation I made for create and craft shopping channel. This card is made on a 6 x 6″ white card stock. I have matted and layered different size grey and white card to create a classic look for a wedding card, this colour scheme never dates. Its a classic look. 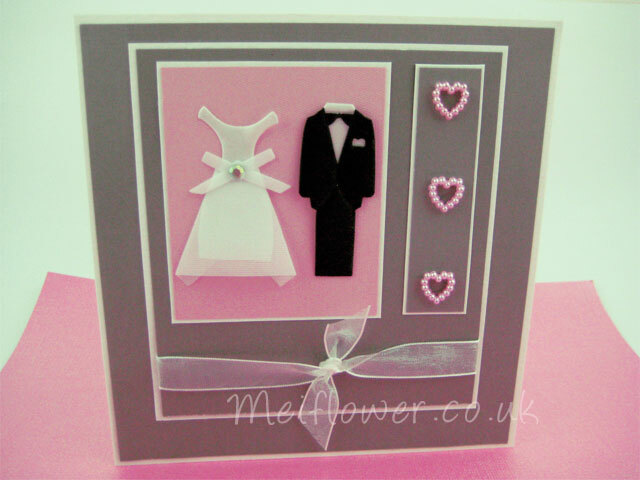 I love using the bride and groom, they can be used on simple card designs. 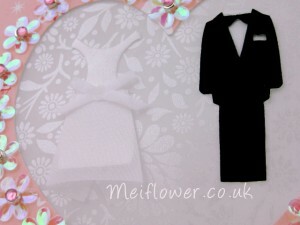 I have mounted the bride and groom on textured pearlescent card and layered onto white card. 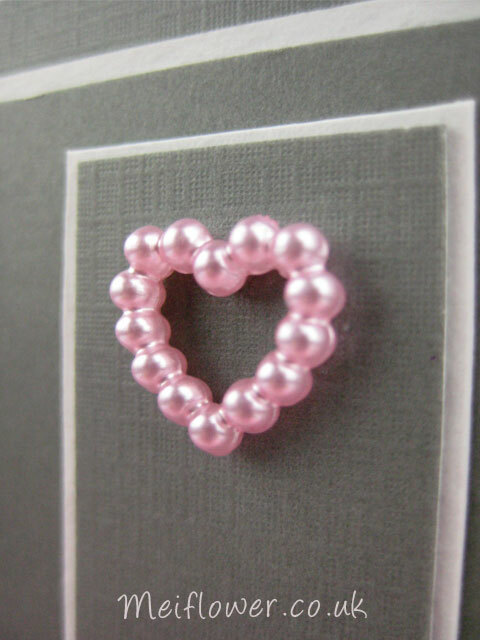 I have chosen the pretty pink beaded hearts to go with the pink card stock behind the bride and groom. To prevent too much glue going onto the card, put the glue onto a piece of waste card first. By the way i use solvent free UHU glue, it is strong and dries quick. 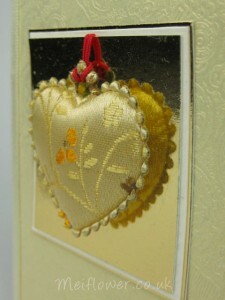 Using a pair of tweezers, dip the beaded heart into the glue slightly and then stick the heart onto the card. It gives a nice clean finish. My Hubby has a friend who likes to ask me to do special cards for his work colleuges. It’s nice to take a break from making card samples for Meiflower and do something completely different. He did not specify what type of card he wanted, so i was left to my own devices. 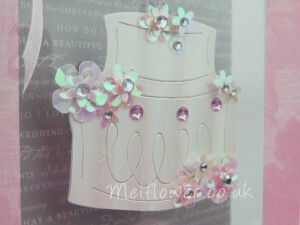 I love using this Sizzix wedding cake die cut. I think I have got my moneys worth the amount of times i have used it for other cards and a wedding scrapbook i made for my sister in law. I have used a 6 x 6″ square white card. On the inside of the card, i have stuck a grey and white printed wedding text paper. So you can see the paper through the aperture. 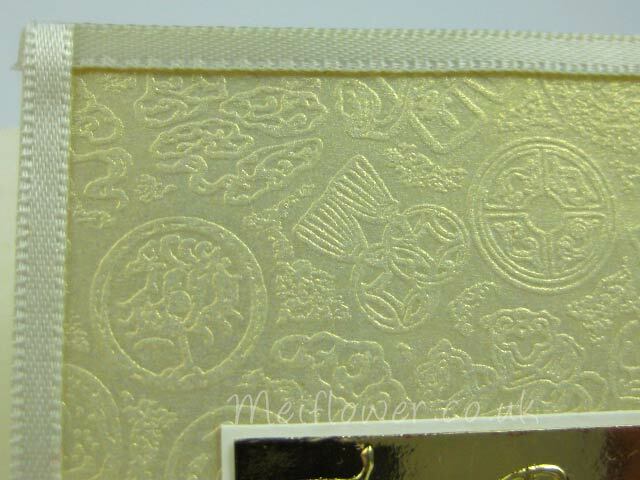 I covered the front of the card with a pretty floral printed paper. Cut out a aperture, stuck acetate onto the back of the aperture. 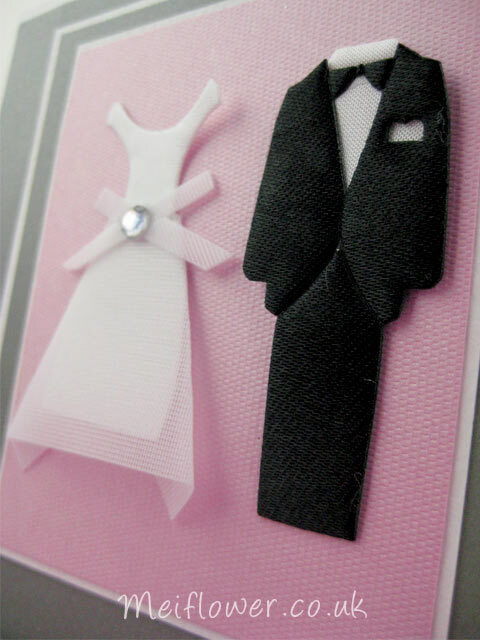 I cut out the wedding cake from a irridescent white card and stuck the die shape onto the front of the card. I have embellished the die cut wedding cake with pretty opague and irridescent flowers. 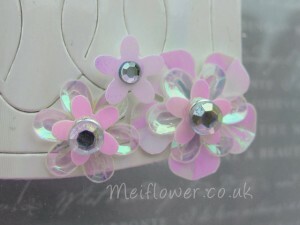 Simple idea of layering a 5 petal, 6 petal and daisy sequins together. Just using the whites and irridescents to complement the cake. 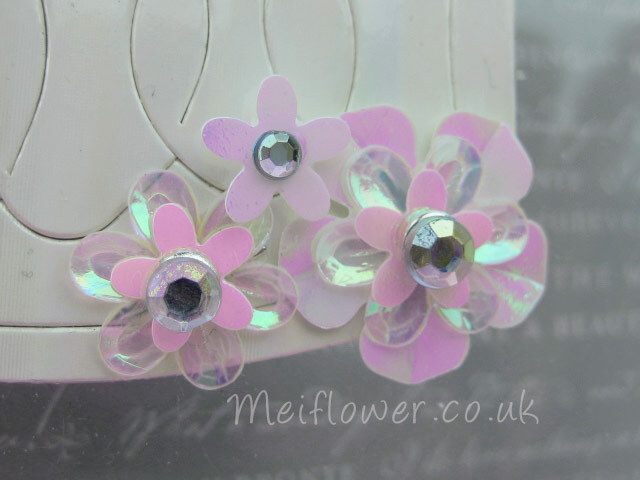 To attach the layered sequin flowers together, i have used a silver brad with a self adhesive gems on top of the brads. I wanted to share this bride and groom wedding card with everyone because customers at the craft show love this wedding card. I bought a gorgeous vellum from The Craft Bug last year, it has been in my craft stash for a while. Too pretty to use but i had this idea in my head for a heart aperture card. 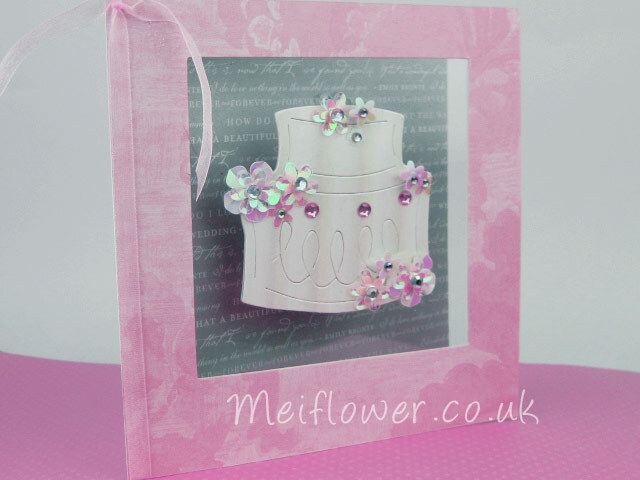 I have used a large white square card as the base card, covered the front with pink patterned wedding paper. Cut a heart aperture using my sizzix die. 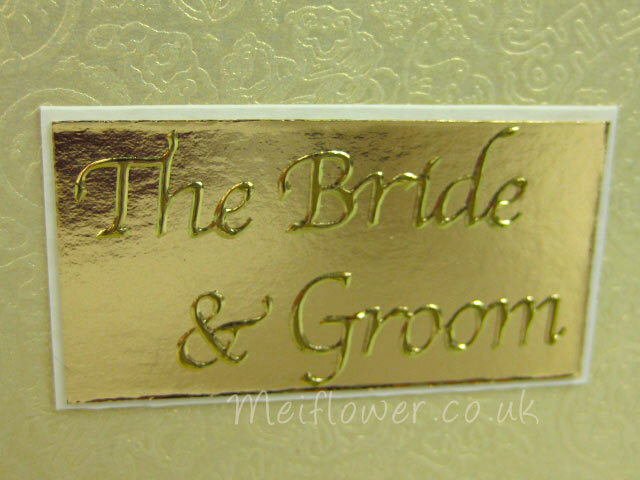 Around the edge of the card, i have used double sided tape with glitter sprinkled on top. I have used a gorgeous patterned vellum on the aperture card, stuck the bride and groom embellishment on top of the vellum. Around the aperture heart, i have used irridescent sequin flowers. To attach them to the card, pierce a hole with a polka tool. I have popped a silver brad through the sequin flower. 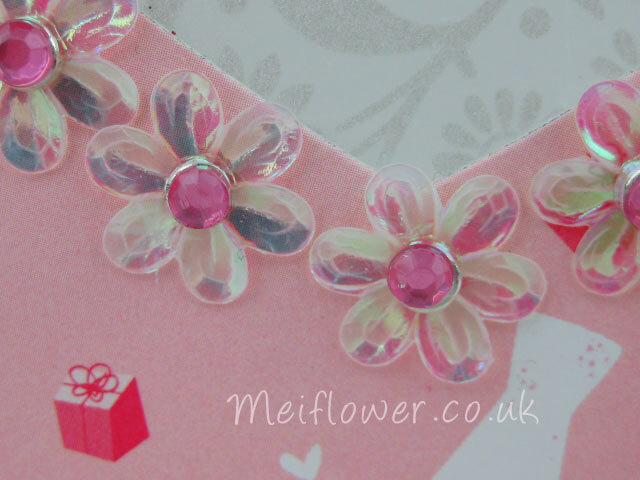 On top of the silver brad, i have stuck a self adhesive pink gems to finish off the card. My brothers best friend is getting married on 28th December, its going to be a chilli day. Hope it is not going to be snowing or i will be wearing my snow boots. I hate wearing sandals in the middle of winter. I still need to make them a special wedding card. My mum has put a order in for a wedding card as well. 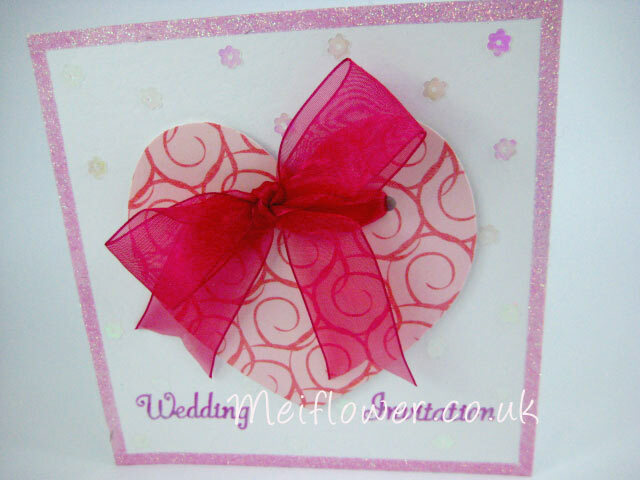 I have still got a lot of wedding card samples from Create and craft shopping channel which i need to put on my blog. 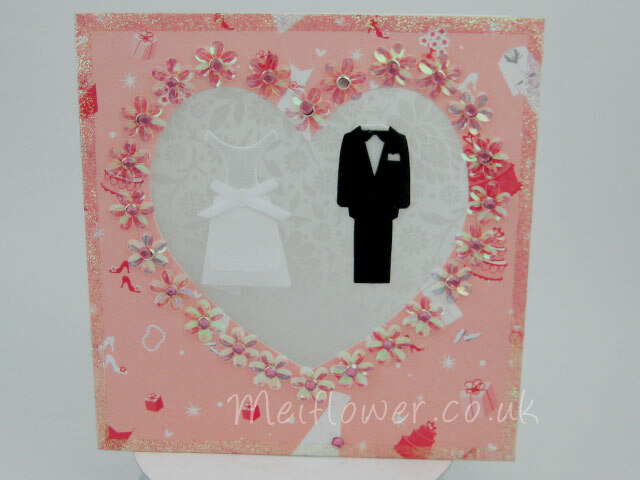 This wedding card is made with a Sizzix heart die cut . The paper was a sheet from a paper pack from the craft show last year. 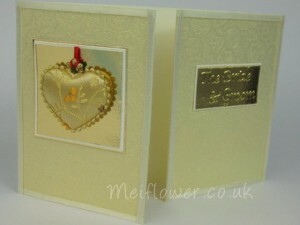 I have used a large white square card as the base stock. 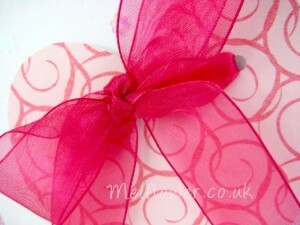 Used thin double sided tape around the edge of the card with pink glitter sprinkled on top to create a glittery border. After i cut the heart out of pattern paper, i punched out to holes to thread the wide cerise organza ribbon through and tied a bow through the middle. It’s nice to give more texture to a card with a beautiful bow.